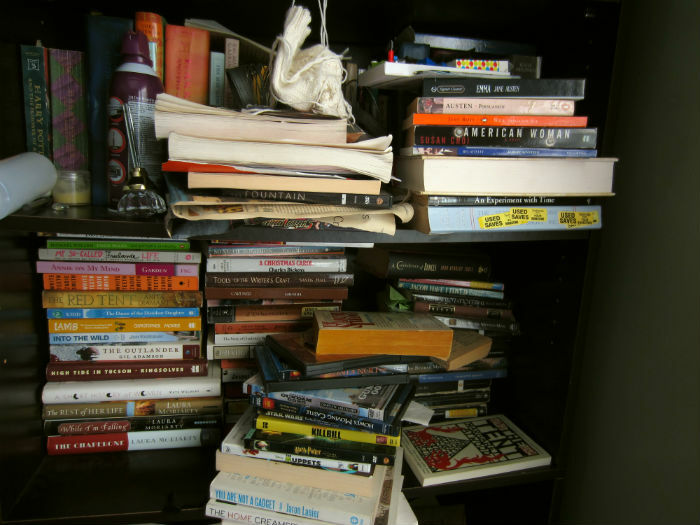 Books are the number one hardest thing for me to get rid of. I thought it would be yarn or fiber arts related goods, but selling my drum carder taught me that I’m just fine without it. Books though. For more than half my life books have been my identity–I was a reader, a writer– it was mandataory that I have a large book collection. And the tall one had become a place to keep things out of toddler’s reach. I had two rules. in discarding. 1. I had to really love the book, and want to reread it and / or use it in future in order to keep it. 2. If I loved it, but had the eBook, I had to get rid of the paper copy. 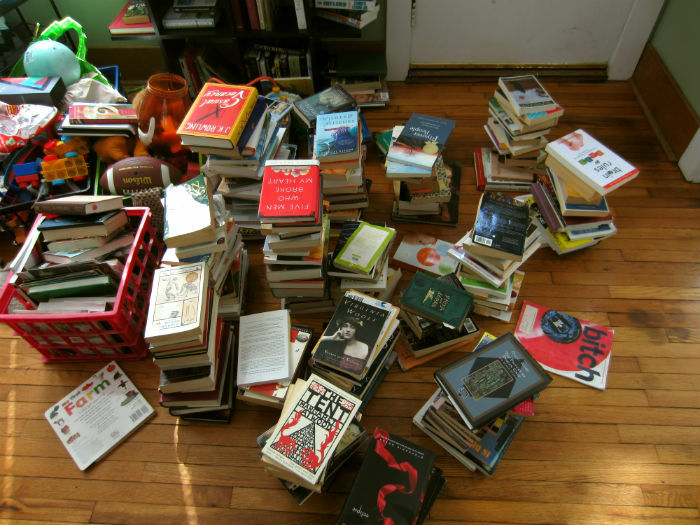 Out of about 300 books, I only ended up keeping 100, most of which fit on the one bookshelf in the bedroom. 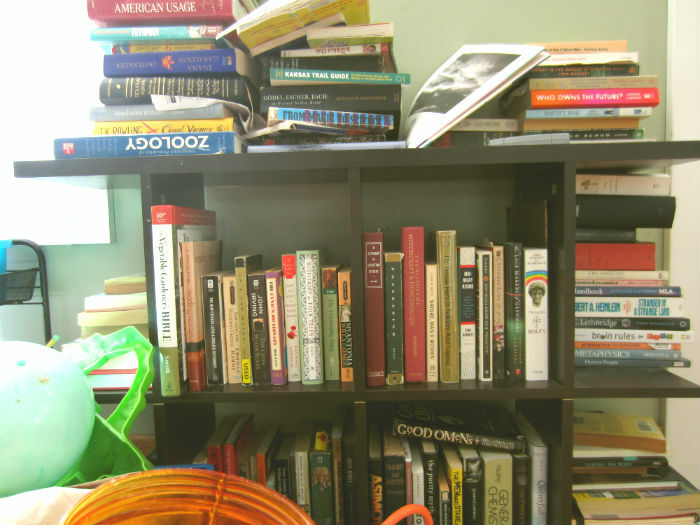 The rest are all art/business related books, so they will live in the studio, and even then, there are only about a dozen. Most of the books I am gettind rid of are old books I either couldn’t or didn’t want to sell back to the college bookstore. For some reason, when I was in college, I wanted to keep all of my English-major related books. 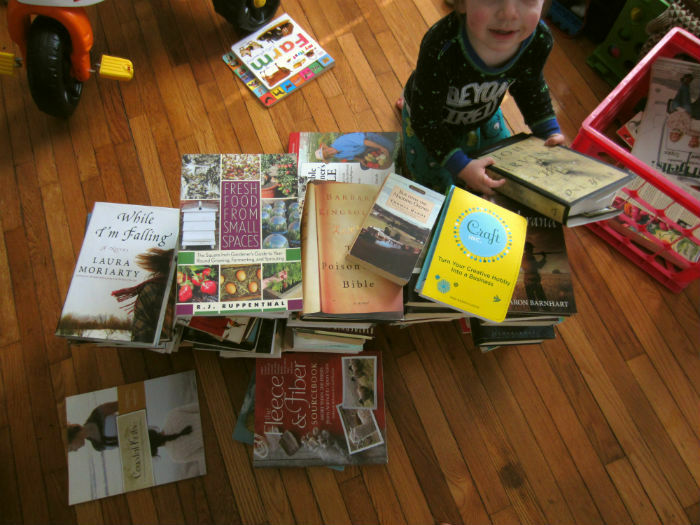 Felix is helping sort books. I haven’t cracked a single one of them in the five years since I graduated. Obviously, I’m over it. Not surprisingly, the books I kept were by the authors I love the most, John Irving, Barbara Kingsolver, Thomas Hardy, The Brontes, etc. The rest are about gardening and farming–all of the things that make me dream and give me joy. One surprise was that I kept only two knitting books. I am discarding some gorgeous pattern books (interested in snatching one up? Stay tuned, I’ll have them up for grabs in a few days), because I almost always knit from indie patterns on ravelry. Downloading patterns takes up so much less space. 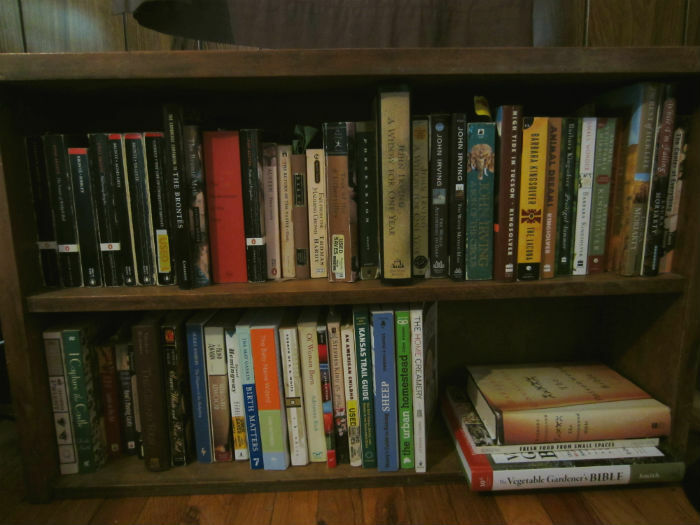 Now I have all of my books in one place, organized by author and subject, and easy to find. I expected to me be sad to see so many volumes go, but I feel lighter for having pared down my collection to only my favorite books. 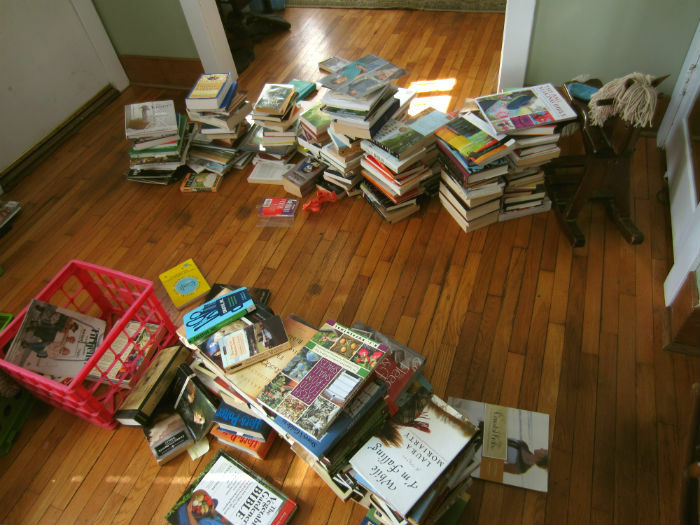 And, next time we move, we’ll have 200 fewer books to haul. What are the books you can’t live without? PS, You might have noticed that I didn’t blog about purging my closet. It’s always been easy for me to get rid of clothes, I have little emotional attachment to most garments, and generally only buy what I need to get by for awhile. I would like to be more intentional about what I bring into my collection in the future, but being in the middle of a pregnancy, clothes only cross my mind when I complain about how all my maternity pants are still too big, and all of my regular pants are way too small.